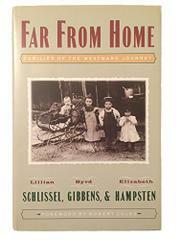 Personal histories, mainly based on letters, of three pioneer families who settled on the frontier of the American West in the 19th and 20th centuries. The authors fill in biographical detail, but for the most part allow their subjects to speak through letters written in stark, unschooled English that is powerfully moving in its simplicity--as, for example, when Abigail Malik writes, after describing in terrible detail the accidental drowning of her son while migrating to Oregon: "It has almost kild Me but I have to bear it." These are not stories of prominent or influential people; nor are they stories of sensational poverty. Rather, they might stand for the legions of little-remembered middle-class families whose struggles helped build America. The narratives embrace the period from about the middle of the 19th century in Oregon Territory, to late 19th-and early 20th-century Colorado and New Mexico, down to settlers in near-contemporary North Dakota. Perhaps the most remarkable aspect of these histories is their power as a corrective to the mythical notion that the settling of America was and is one continuous and nearly universal success story. The truth, as these poignant portraits remind us, is that many people worked hard only to see their accomplishments shattered and destroyed virtually without a trace--this is the dark side, in other words, of the "American dream." It is impressive to think that these letters, preserved by chance, have survived the hardships that so tried the energy and patience of the writers--and that they can still speak to us and tell us important things about our past.